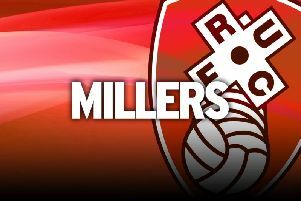 Striker Leon Best and coach Nicky Eaden have become the first casualties of new manager Alan Stubbs’ reign at Rotherham United. Stubbs was officially unveiled as boss yesterday and not much more than 24 hours later the exit door opened twice. Best, who played a part in the Millers’ march from the drop zone to Championship survival last season, had been offered a new deal before Stubbs’ appointment. But the 29-year-old attacker, who scored four goals in 16 appearances, hadn’t agreed to the terms and Stubbs will now look to bring in his own choice up front. Eaden departed by mutual consent, having never been given the chance to prove himself in the job he was brought in to do. He was appointed assistant manager by Neil Redfearn in February, leaving his role as head of Leicester City’s under-21 operation to come to AESSEAL New York Stadium. But Redfearn was sacked only three days later and Eaden was eased out of the first-team picture when Neil Warnock arrived to inspire Rotherham’s safety push. Stubbs said one of his first jobs would be to talk with the club’s five out-of-contract players. Best has now gone, and the the fate of defenders Kirk Broadfoot, Stephen Kelly, Richard Wood and attacker Matt Derbyshire, who were all made offers last month, should become known in the next few days. When asked about Eaden’s position at yesterday’s press conference, Stubbs, who has brought John Doolan with him from Hibernian to be his No 2, said: “We will look at everybody who is here. We will look at the roles it entails and if they are happy with that then great. Long-serving fitness coach Paul Warne and goalkeeping coach Andy Dibble both remain with the club. “Right now, the people who are here, they will have the trust of me to do the job,” Stubbs said. Meanwhile, Stubbs has already been busy familiarising himself with the 10 Millers players who are under contract as he also targets his first signings in the Rotherham hot-seat. “I already know of them anyway,” he said. “And I’ve already been sent clips of them - strengths and weaknesses. We’ve all got weaknesses, no matter what.